The Sounders play archrival Portland in the first of a two-leg Western Conference semifinal this Sunday at Providence Park. The two sides are 2-2 in all-time playoff series across all eras since 1975, with the Timbers winning their lone MLS postseason meeting in 2013. Sounders coach Brian Schmetzer knows there’s no point telling his team to treat this upcoming playoff series with the rival Portland Timbers like any ordinary postseason round. So much for avoiding hyperbole ahead of the fifth playoff matchup between franchises and second in the Major League Soccer era. Schmetzer was the Sounders’ head coach in two of those meetings last decade and an assistant to Sigi Schmid in 2013 when Portland eliminated the Rave Green 5-3 on aggregate in the Western Conference semifinal. Only midfielder Osvaldo Alonso remains from that Sounders squad among regulars (reserve forward Lamar Neagle has played just one minute in five months and none since July). So, perhaps out of a sense of history, Schmetzer had a hard time disguising his giddiness at this two-leg conference semifinal draw, which opens Sunday at Providence Park and concludes Thursday night at CenturyLink Field. Sounders midfielder Nicolas Lodeiro, sporting a new bleached-blonde hairdo after a “promise’’ made to a teammate, seemed to take cues from his coach in describing what’s ahead. The rivalry, often described as the closest thing North America has to a European-style “derby,” has had its ups and downs since the last playoff meeting. Both have won an MLS Cup championship since — the Timbers in 2015 and the Sounders in 2016 — and now aspire to loftier things than Pacific Northwest supremacy. Still, things heated up this summer, with the Timbers winning their first regular-season MLS match at CenturyLink Field 3-2 on June 30. The Sounders have since gone 15-2-2 — returning the favor Aug. 26 by shutting out the Timbers 1-0 for their first victory at Portland in four years — to earn a first-round playoff bye. One could forgive the Timbers for being envious at the Sounders’ week off. 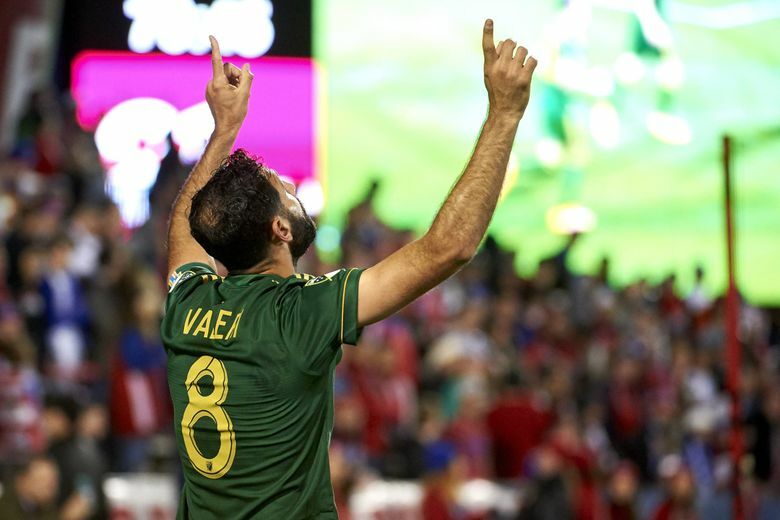 After all, the Timbers outplayed them in all three head-to-head meetings this season, winning the first two. Portland had to win a midweek knockout game on the road at FC Dallas after a decision to rest starters for their season finale backfired and cost them an opening-round home match. Still, since the knockout round was implemented in 2011, teams that won it have eliminated opponents coming off byes in 10 of 20 ensuing playoff series. And given the history between these squads, you can throw away regular-season statistics. That’s easier said than done. The Timbers will likely come out supercharged behind a fired-up home crowd. Intelligence sometimes gives way to emotion when the Sounders and Timbers meet. Whether it was Clint Dempsey tearing up a referee’s notebook in 2015 or Roger Levesque scoring 47 seconds into a 2009 U.S. Open Cup match — then pretending to be a tree felled by an invisible ax swung by Sounders forward Nate Jaqua — players can wear their feelings for all to see. A travel guide to Seattle for Portland fans on the Timbers Army website mocks the Sounders as a team with a “game show host’’ as minority owner, a marching band and “blinding’’ kit colors. It proclaims the Sounders “the team that even non-Pacific NW supporters groups go out of their way to hate’’ and lists Red Lobster as this city’s top seafood restaurant. ECS fans have gotten the better of Timbers Army in top-secret pregame Tifo displays, the most notable being a multilayered “Decades of Dominance’’ banner unfurled in May 2011 before the first MLS meeting between the teams. A combined effort that day with North End Faithful supporters at CenturyLink Field — who unfurled their own “We Are Faithful. We Are Sounders’’ banner that appeared to directly respond to a “Who Are You?’’ Tifo rolled out moments earlier by Timbers Army — wound up winning the day. Both groups take the signage thing almost as seriously as what transpires on the field. The Sounders own a 49-37-14 all-time advantage, including a 9-7-6 mark in MLS play. But the teams are 2-2 in four playoffs, the Timbers taking a one-game North American Soccer League quarterfinal 2-1 in 1975 before the Schmetzer-coached A-League Sounders won a two-leg conference semifinal 3-2 on aggregate in 2004. The following year, when the A-League became the United Soccer League First Division, Schmetzer’s team bested Portland 3-0 on aggregate in a two-leg opening playoff round. But the Timbers evened things in 2013, spoiling Dempsey’s debut season with a 2-1 upset win at CenturyLink Field and a 3-2 victory at Portland. Schmetzer for years afterward kept a photograph of former Timbers coach Caleb Porter glaring at the Sounders bench. Porter left the Timbers after last season. But for Schmetzer, the reason behind keeping the photograph remains. “It was a reminder for me that it hurt,’’ he said. By next Thursday, he’ll know whether that desktop addition was worth it. One of these teams is going away “hurt’’ next week and if history is any indication, it will take a long time to get over.